Ion-Ion Interactions that occur within a compound between a metal (cation) and a nonmetal (anion) an ionic bond. This occurs when there is a net loss and gain of electrons from the cation to the anion. Hence, electrons are transferred. 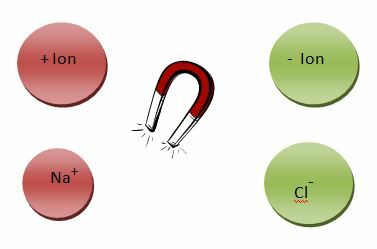 The level of attraction between the two ions is great, making ionic bonds the strongest bonds. NaCl is a posterchild example of such a bond, a salt composed of a metal and a nonmetal. This is a match made in chemistry heaven. Partially charged atoms are called dipoles and may be either be positive dipoles δ+or negative dipoles δ–. They can also be noted by a single-headed arrow, whose head points towards the more – ion, the δ-, and a + tail which points towards the δ+. The term “dipole” simply means two (di) poles (opposite poles, a positive and a negative). This type of bonds occurs between nonmetals. 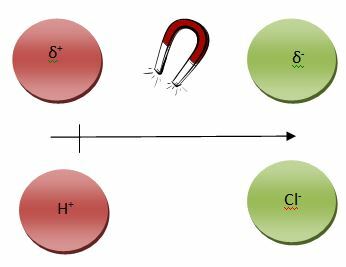 Dipoles of two nonmetals within a compound are called covalent bonds, which while strong, are not as strong ionic bonds.. This occurs when there is not net loss or gain of electrons, or transfer, but rather, the electrons are shared between the two atoms. 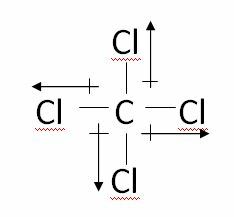 Carbon tetrachloride is an example of a nonpolar compound because the dipoles are balanced. Notice that all dipoles (up/down and left/right) cancel one another out. Also, the central atom, carbon, is surrounded by all hydrogen atoms and contains NO lone pairs of electrons. Polarity can also be determined using dipoles (and dipole moments) and electronegativity differences.